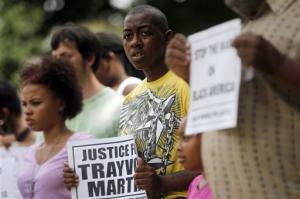 NEW YORK (AP) – Blacks and whites from all across the country locked arms in rallies to protest the Zimmerman verdict. Thousands of demonstrators from across the country - chanting, praying and even fighting tears - protested a jury's decision to clear neighborhood watch volunteer George Zimmerman in the shooting death of an unarmed black teenager while the Justice Department considered whether to file criminal civil rights charges. Rallies on Sunday were largely peaceful as demonstrators voiced their support for 17-year-old Trayvon Martin's family and decried Zimmerman's not guilty verdict as a miscarriage of justice. Police in Los Angeles said they arrested several people early Monday after about 80 protesters gathered in Hollywood on Sunset Boulevard and an unlawful assembly was declared. The New York Police Department said it arrested at least a dozen people on disorderly conduct charges during a rally in Times Square. The NAACP and protesters called for federal civil rights charges against Zimmerman, who was acquitted Saturday in Martin's February 2012 shooting death. The Justice Department said it is looking into the case to determine whether federal prosecutors should file criminal civil rights charges now that Zimmerman has been acquitted in the state case. The department opened an investigation into Martin's death last year but stepped aside to allow the state prosecution to proceed. The evidence generated during the federal probe is still being evaluated by the criminal section of the Justice Department's civil rights division, the FBI and the U.S. attorney's office for the Middle District of Florida, along with evidence and testimony from the state trial, the Justice Department said. Meanwhile, President Barack Obama and religious and civil rights leaders urged calm in hopes of ensuring peaceful demonstrations following a case that became an emotional flash point. Sunday's demonstrations, held in cities from Florida to Wisconsin, attracted anywhere from a few dozen people to a more than a thousand. At a march and rally in downtown Chicago attended by about 200 people, some said the verdict was symbolic of lingering racism in the United States. Seventy-three-year-old Maya Miller said the case reminded her of the 1955 slaying of Emmitt Till, a 14-year-old from Chicago who was murdered by a group of white men while visiting Mississippi. Till's killing galvanized the civil rights movement. "Fifty-eight years and nothing's changed," Miller said, pausing to join a chant for "Justice for Trayvon, not one more." In New York City, more than a thousand people marched into Times Square on Sunday night, zigzagging through Manhattan's streets to avoid police lines. Sign-carrying marchers thronged the busy intersection, chanting "Justice for! 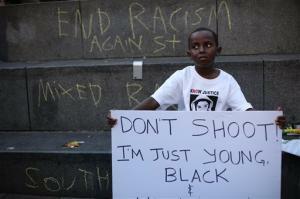 Trayvon Martin!" as they made their way from Union Square, blocking traffic for more than an hour before moving on. In San Francisco and Los Angeles, where an earlier protest was dispersed with beanbag rounds, police closed streets as protesters marched Sunday to condemn Zimmerman's acquittal. Los Angeles Mayor Eric Garcetti urged protesters to "practice peace" after the rock- and bottle-throwing incident. Later, more than 100 officers in riot gear converged on the crowd and ordered people to disperse. Police said they made seven arrests throughout the day, The Los Angeles Times reported. Rand Powdrill, 41, of San Leandro, Calif., said he came to the San Francisco march with about 400 others to "protest the execution of an innocent black teenager." "If our voices can't be heard, then this is just going to keep going on," he said. Earlier, at Manhattan's Middle Collegiate Church, many congregants wore hooded sweatshirts - similar to the one Martin was wearing the night he was shot - in a show of solidarity. Hoodie-clad Jessica Nacinovich said she could only feel disappointment and sadness over the verdict. "I'm sure jurors did what they felt was right in accordance with the law but maybe the law is wrong, maybe society is wrong; there's a lot that needs fixing," she said. Protesters also gathered in Atlanta, Miami, Milwaukee, Philadelphia, and Washington, D.C., along with a host of other cities. In Miami, more than 200 people gathered for a vigil. "You can't justify murder," read one poster. Another read "Don't worry about more riots. Worry about more Zimmermans." Carol Reitner, 76, of Miami, said she heard about the vigil through an announcement at her church Sunday morning. "I was really devastated. It's really hard to believe that someone can take the life of someone else and walk out of court free," she said. In Philadelphia, about 700 protesters marched from LOVE Park to the Liberty Bell, alternating between chanting Trayvon Martin's name and "No justice, no peace!" "We hope this will begin a movement to end discrimination against young black men," said Johnathan Cooper, one of the protest's organizers. "And also to empower black people and get them involved in the system." In Atlanta, a crowd of about 75 protesters chanted and carried signs near Centennial Olympic Park. "I came out today because a great deal of injustice has been done and I'm very disappointed at our justice system; I'm just disappointed in America," said Tabatha Holley, 19, of Atlanta. But not all the protesters heeded those calls immediately after the verdict. In Oakland, Calif., during protests that began late Saturday night, some angry demonstrators broke windows, burned U.S. flags and started street fires. Some marchers also vandalized a police squad car and used spray paint to scrawl anti-police graffiti on roads and Alameda County's Davidson courthouse. Associated Press reporters Suzette Laboy in Miami, Terence Chea in San Francisco, Keith Collins in Philadelphia, Pete Yost and Eric Tucker in Washington and Luisa Leme contributed to this report.